I'm not sure if you've noticed but lately I haven't been updating my blog frequently. This is mostly due to my poor time management skills. I could say that I'm just really busy but everyone says that. Truth is I've been putting in very long hours working for my dad doing various HVAC and plumbing work. I've been averaging 10 hour days since I returned from Colorado. Even with the long hours I have been able to squeeze in a few pictures here and there. Lately I have been really captured (forgive the pun) by long exposures of those little sparkling lights in the sky we call stars. The above picture was taken after I was done with work at about 11:30pm. Reuben came along to keep my company while the exposure was being completed. 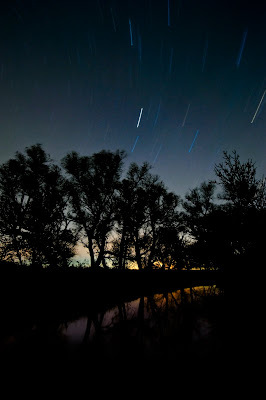 Taking star trail pictures is not very difficult. The hardest thing is finding a perfectly clear sky with no major cities near you. The smog, combined with the city lights, will over expose your pictures and what could have been crisp star trails become nothing more than uninteresting smears of light. That is why you don't see pictures of the Eiffel Tower with the stars streaming behind it. 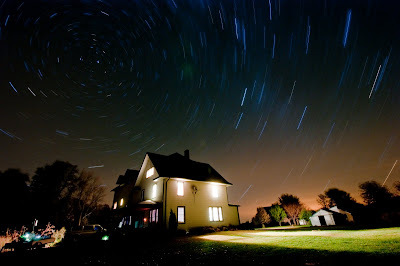 The other part of taking star trail pictures is your exposure. If you are going to take really long exposures you really don't want to have to take very many test shots. I bet you can figure out why! So think through your camera settings before you take a 30 minute shot! 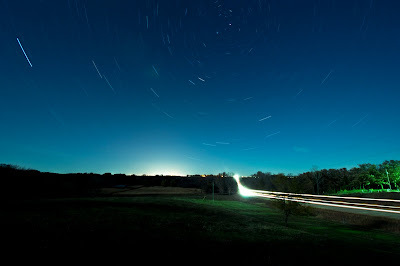 Shooting in Manual mode with the shutter speed set to "bulb"